Today, I decided to take some pictures of my thump coffe cups in my worm bins. The cups are 100% compostable and made from sugar cane and lined with material derived from corn. Most of the compostable products made today are meant to be hot composted in a commercial facility, but I like to see what happens when these products are put into a cold composter like a Red Wiggler bin. 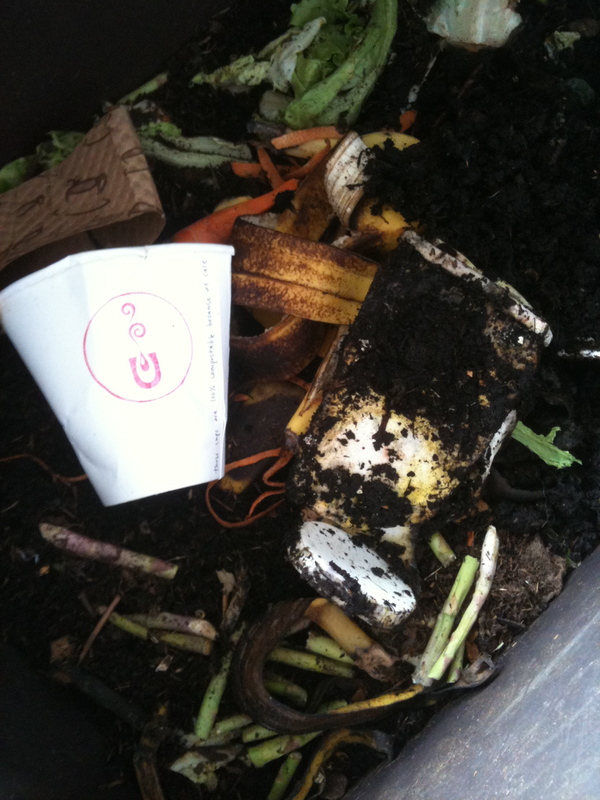 I have conducted many, many tests with compostable products. 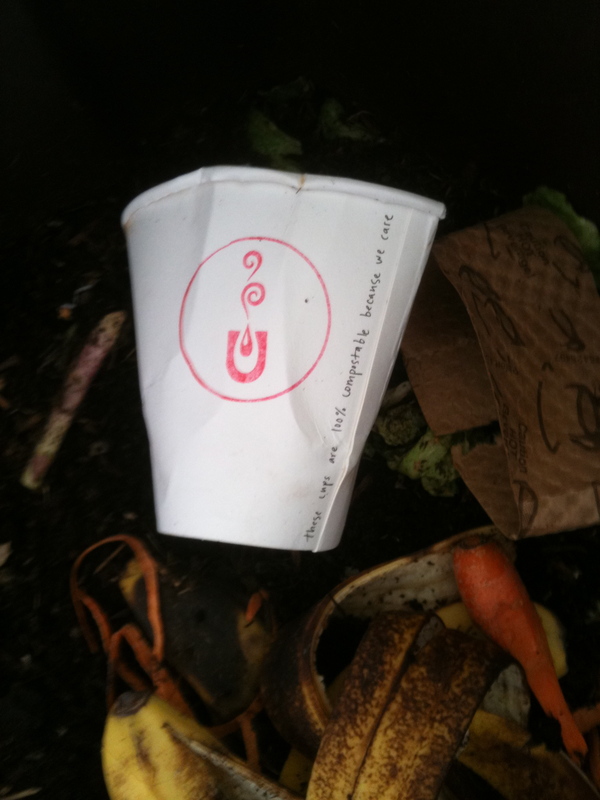 Compostable plates, cups, utensils, and packages have been put to the test. They are all breaking down at various rates with the plates being the quickest. thump coffee (yes, I realize the “t” is not capitalized. That’s their logo. Bravo Carlos) cups are breaking down rather quickly too. The Red Wigglers are doing fine and are not bothered by the cups. Some days I can find them inside cleaning up the leftover coffee! Miller Elementary has worms and more! Thanks Miller Elementary’s PTO for purchasing 2 Wonder Worman Worm Bin Packages! The Red Wigglers are ready to chomp on fruit and veggie scraps from the students and staff. 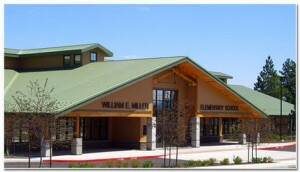 Miller Elementary is a LEED (Leadership in Energy and Environmental Design) Certified School. Most of their standards revolve around the “3 R’s (reducing, reusing and recycling) which begin during construction and continue through the life of the school. Having Red Wigglers recycle their usable waste fits perfectly into the school’s concept. For more info on Miller’s design click here. Aspen Academy has joined the Red Army! Today, I went to deliver a pound of Red Wigglers to Aspen Academy, a BEAUTIFUL preschool in a quiet neighborhood in Bend. When I pulled up, I was really impressed with the school. 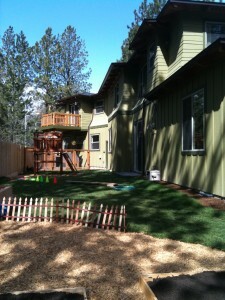 The yard was well manicured with a play structure and fun toys appropriately placed on the lawn. There was a chicken coop, sand box and raised garden beds, welcoming the kids to come and play. Teresa, owner, director and lead teacher, was inside the school on the floor engaged with 2 little ones, sorting some toys. I greeted her as Laurie then had to elaborate and let her know I was Wonder Worman. Then the connection was made. She only knew me as Wonder Worman :^) She led me to the worm bin, and I released the Red Wigglers into their new comfy plastic bin which was already set up with bedding and holes for aeration. Teresa decided to purchase Red Wigglers after Denise from the Environmental Center visited and shared the value vermicomposting. Composting fits into the philosophy of Aspen Academy. They are a certified Eco-Friendly Child Care Provider. Check out their web site for full details. 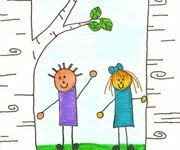 I am happy to know my Red Wigglers will be members of another nature friendly school. Here’s a shot of the back yard. The raised beds are in the foreground, the play structure in the middle, and the chicken coop in the background. 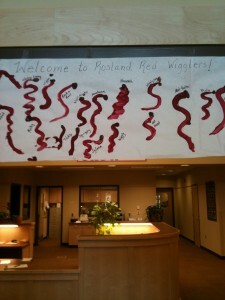 Welcome to Rosland, Red Wigglers! I wanted to share this adorable poster that welcomed me upon my arrival at Rosland Elementary in La Pine. Mrs. Ayres hung this in the foyer after her first graders wiggled their fingers on the paper. The kids were so excited to have new wiggler friends at Rosland to share their fruit and veggies scraps!